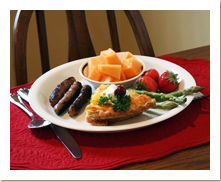 Amil’s Inn Bed and Breakfast is nestled in the Kickapoo Valley in Wilton Wisconsin. This delightful country home was constructed by Amil Reeck and his wife, Whilhelmine “Minne” in 1910, and has been fully remodeled by Amil’s grandson, David Reeck. David and his wife Anita welcome you into their historic home that captures the allure of times gone by, with all the comforts of today. 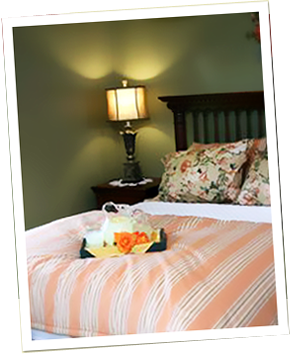 The newly remodeled home has four guest rooms each with private baths. Located 2.5 miles south of Wilton, Wisconsin, the Bed and Breakfast is just minutes from the Elroy-Sparta Bike Trail, Wildcat State Park, and the Kickapoo Valley Reserve. Wilton is a village in a small setting of farming and surrounding hills that is located mid-trail between tunnels no.1 and no.2 on State Hwys. 71 and 131, 15 miles south of Tomah, the entrance to the Kickapoo River Recreation Area. 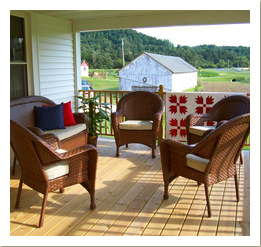 Nearby you will also find horseback riding, canoeing, antique shopping, cranberry tours, Amish tours and so much more. The Reeck family invites you to join them for quality accommodations in the beautiful countryside of Wisconsin’s Kickapoo Valley.